Hello! 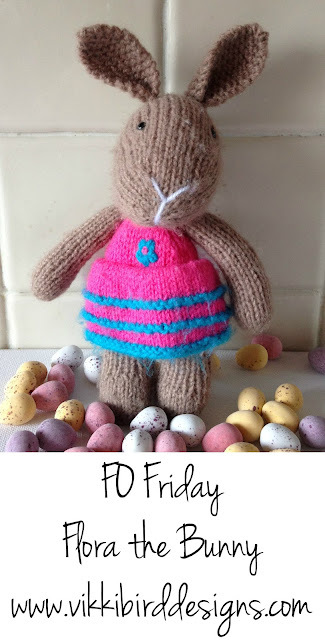 I have a slightly belated FO Friday for you today - I meant to post this last Friday in time for Easter, but time got the better of me again... A few weeks ago, my daughter made a special project request - this adorable bunny kit that came with issue 85 of Knit Now magazine. The knitting was pretty straightforward. The only bit that was annoying was the three row stripes on the skirt, which technically meant you couldn’t carry the yarn up the side (I got round this by knitting the skirt on circular needles and sliding the work along the needle at the end of the three row sections so the working yarn in the right colour was in the right place). I quite quickly ended up with a small pile of easily identifiable body parts! Sewing up was trickier. The instructions has you sew and stuff the body then the legs, which meant stuffing the legs through a tiny hole (I got my three year old to help, her fingers are much smaller than mine!). Less than ideal. At that point I gave up following the instructions and just made it up as I went along. I embroidered the flower and put the skirt on before I put the head on, which made life a bit easier. The bunny had a finishing touch of a big fluffy pompom for a tail, which was so much fun to add (my pompom was a bit bigger than mentioned in the pattern as that was the size of pompom maker I happened to have - kindly loaned by a friend). Overall I was really happy with this project. The knitting was easy and the final bunny does look like the picture. My daughter loves the bunny, who has now been named Ginger, and has clutched Ginger sufficiently tightly that Ginger’s neck is a tad on the scrawny side, but that happens to a lot of our small toys, handmade or shopbought!